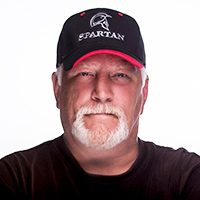 Spartan has been a part of the community in the greater Tacoma area for many years. It is our goal to provide exceptional plumbing services with a personal touch. We have experienced, highly knowledgeable technicians who are the best in the industry. Our office staff places customer concerns above all other duties. We all know how stressful plumbing or drain cleaning issues can be, which is why it is our mission is to build customer loyalty by doing what’s right. 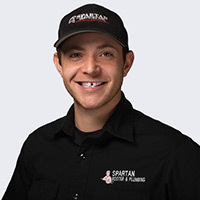 Mason is the proud new owner of Spartan Services, a family-owned and operated plumbing company. He has ten-plus years’ experience in the plumbing industry, and started out working for his dad while in high school. 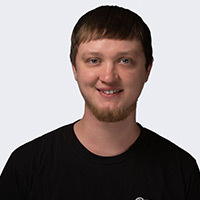 What he likes about the business is, “It’s something new every day, not assembly line type work.” He also likes being able to solve and fix problems for people, especially emergencies. “It’s a good feeling to help get them off the ledge and get things back in order.” Mason is also excited about the future for Spartan Services and the plumbing industry in general; aside from the technological changes that have helped Spartan Services go paperless and real-time, he sees one of the next areas for technology improvements in the handheld or mobile device arena. Soon, we may be able to check our water usage on our phone, receive an alert to leaks or shut valves down, and mitigate emergencies. Born and raised in the Bonney Lake area, Mason enjoys watersports such as boating and surfing. He also enjoys hot rod cars and tinkering or working on his house. He has a Boxer named Astro. 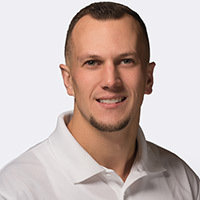 Jonathan grew up in University Place, graduating from Curtis High School and then enrolling at Clover Park Technical College for HVAC. 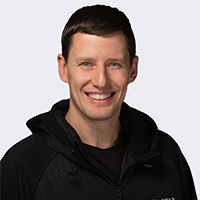 He enjoys working with his hands and his learning style is “learn by doing,” so that brought him into the plumbing industry about 12 years ago. He loves plumbing because he gets to help people, figure out problems and deliver solutions that get customers back to being able to use their shower/toilet/sinks, etc. in short order. 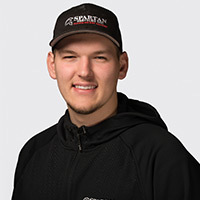 He also loves to teach people about plumbing and drain cleaning and what good customer service looks like, so working as the Service Manager for Spartan is a perfect fit for him. In his spare time he loves to work on cars. He is married, has one seven year old son, two dogs and two cats and wants to get another big dog. Cosette brings 25+ years of experience to Spartan working on both the revenue generating and operational side of the business and has a passion for growing healthy organizations. Her diverse background includes executive management/ownership in engineering, manufacturing, telecom, HVAC and running a business incubator. Cosette is married and has three grown children and two grandchildren and a 110 pound yellow lab, named J.C. She loves running, hiking, kayaking, golfing, skiing, snowshoeing and most outdoor activities. 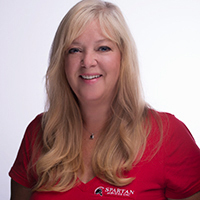 Anne came to Spartan with extensive experience in small business, customer service, and paperless office systems. 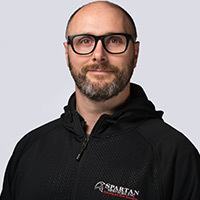 It has been exciting for her to see Spartan move from paper systems to iPads for the service technicians, and a computerized dispatch and invoicing system for the office staff. She enjoys being challenged to pursue innovation for Spartan. Anne spent time on both coasts before settling with her family in Washington. Anne loves Arabians and showed horses for 30 years. Now she loves to travel, and enjoys boating and classic cars. Valerie is the office manager/bookkeeper at Spartan Services, and brings 15 years of experience in administrative work, office management, and bookkeeping. She says she’s never worked for a better company than Spartan Services. She really likes and respects the ownership, and believes they are genuinely nice people who listen to their employees and help them grow in their responsibilities and skills. Born in Tulsa, Oklahoma, Valerie came to Tacoma as a child with her family in 1974. She graduated high school from Mount Tahoma and went to college to become a teacher, but ended up liking accounting more. She is the mother of three grown daughters and the grandmother of the “cutest” granddaughter in the world. Valerie enjoys camping, hiking, volleyball, and gardening in her spare time. 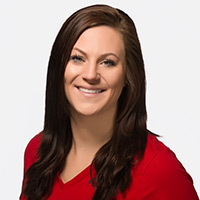 Madison has lived most of her life in the Puyallup area and graduated from Puyallup High School. She likes being the “Ambassador of First Impressions” for Spartan and the customers’ first point of contact. Madison loves to interact with people on a daily basis, so being in charge of dispatching gives her more than enough opportunities. Her hobbies include playing Bingo and Yahtzee with her grandmother, camping, being in the outdoors and playing with her cat and dog. Madison’s 35 pound cat, Bubba is almost as large as her Australian Shepherd dog, Cody. Bayley’s a local girl who was born and raised in Bonney Lake. She graduated from Yelm High School and is currently attending Pierce College, part-time, studying business. Business runs in the family, as her brother, Mason is the current owner and president of Spartan Services. 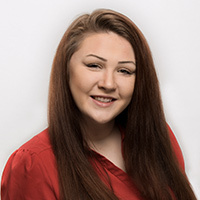 Bayley just recently joined our team in June 2018, as an Account Manager/Salesperson, and helps back-up in Dispatch and Customer Service. Her hobbies include riding horses and going to school. After leaving the Army 21 years ago, Mark became a plumber and is one of the most competent drain cleaners available. He receives many wonderful reviews from happy and satisfied customers because he takes pride in his work and enjoys solving plumbing problems. Married for more than 30 years, he and his wife have two grown boys. Mark loves animals and has two Boston Terriers. He donates 10 percent of his earnings to the ASPCA (American Society for the Prevention of Cruelty to Animals) and if he were “rich,” he would start his own non-profit for helping animals. Jeff loves being a plumber, and believes it’s a very good opportunity for someone without a college degree to make a good, honest living. He enjoys being able to help people fix their plumbing problems at a fair price. 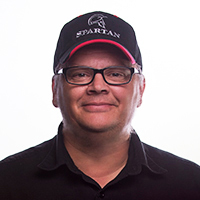 He loves working at Spartan because it’s a company that is family owned and operated. Jeff was born and raised in Port Orchard, and loves spending time outdoors fishing, hiking, and camping. He also enjoys and plays the card game, “Magic.” Jeff is a newlywed and loves his “rescue” dog, an Australian Cattle dog named Ginger. 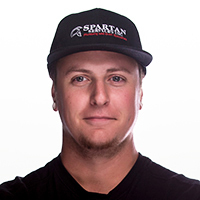 What Sean likes about plumbing is the variety of challenges he gets to see and fix every day. One day it could be repairing an old hot water heater or installing a new one, the next it could be finding and fixing a leak or working with water pressure issues and the next day it could be installing a garbage disposal and hooking up a dishwasher. There’s never a dull moment in the life of a plumber. Sean was born and raised in the area and graduated from Emerald Ridge High School, class of 2009. He loves muscle cars and likes to go to Pacific Raceways and drag race. His racecar is a 66 white NOVA that you might see at Pacific Raceways when he’s not on call or working. He’s a FOODIE too! Craig is a third generation plumber, growing up in the business. As a little boy, when he was sick from school, he would ride around with his dad, making drain cleaning service calls. Born and raised in Tacoma, he attended Washington High School and graduated from Clover Park Voc-Tech. Craig loves his job because he gets to be somewhat autonomous, gets to figure out how to solve problems, and help people. He loves classic cars and motorcycles, and has been a Seahawks fan since 1976. Justin feels like plumbing is his calling – the right kind of job for him. He enjoys the challenge of fixing things and making people happy. Before plumbing, he worked as a maintenance technician for various property management companies, so he was familiar with the value of good plumbing techniques and good plumber technicians. 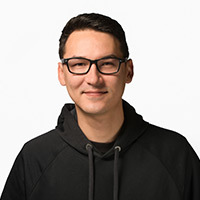 He is a native of Whidbey Island, and enjoys living in the Northwest because there are so many opportunities to explore the great outdoors through hiking and camping. Justin also enjoys tinkering with toys, like his guitar and motorcycle. Likes to work “hands on” fixing things and delivering great customer service. 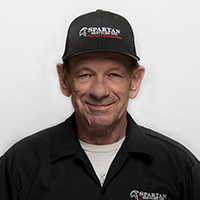 He decided to join Spartan Services after experiencing the excellent plumbing work and customer service he received when he was a maintenance supervisor for a property management company. When not working, he’s fishing! He loves salmon fishing and standing in a river in his waders waiting to hook the big ones. Growing up, he was one of seven siblings, originally from Virginia. His Mother was in the service so he grew up as a military brat and eventually moved to Tacoma with his family. 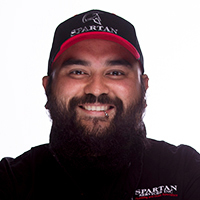 What he likes most about working at Spartan Services, is he feels like he’s part of a big family again. Jack is a long-time resident of Tacoma and a graduate of Mount Tahoma High School. He’s been a plumber for 30+ years because he loves the challenge of solving problems and repairing things. He believes plumbing is a big part of the health, safety and welfare of buildings. Jack’s hobbies include fishing and dirt biking. Eric has been plumbing since he was a senior in high school and says it’s in his family genes to be a plumber. His grandfather was a plumber and his father is currently a licensed plumber in the state of Washington. He’s just carrying on the family tradition. A local boy, Eric graduated from Bonney Lake High School. He loves hiking, camping and the outdoors and his dog, Carlos, a Pitbull/Jack Russel Terrier mix. A local boy and life-long resident of Bonney Lake, Jordan graduated Bonney Lake High School. He followed in his father’s footsteps by becoming a plumber. The best part of plumbing for him is solving complex problems and making people happy. His hobbies include riding dirt bikes and snowmobiling. He has one dog, a boxer and a cat.